The Sony NEX-6 is a new compact system camera featuring a 16.1-megapixel “Exmor APS HD” CMOS sensor, a sensitivity range of ISO 100-25600, Fast Hybrid AF for optimal fast and precise autofocus, 10fps burst shooting, XGA OLED Tru-Finder, Wi-Fi connectivity, PlayMemories Camera Apps, a built-in flash and new Multi Interface Shoe. Other highlights include a mode dial, two control wheels, a dual-axis electronic level gauge, Sweep Panorama mode and 1080p video recording. 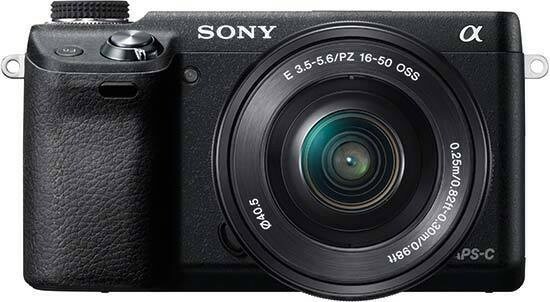 The Sony NEX-6 is available for $849.00/£699.00 body only and $999.99 / £799.00 with the new 16-50mm OSS Power Zoom lens. In the UK, it's also sold in a double-zoom kit with the 16-50mm and 55-210mm lenses, priced from £949.99. Announced just before Photokina 2012, the Sony NEX-6 slots in between the consumer-focused NEX-5R and the range-topping NEX-7, and adds a number of features and functions that you cannot find in either of these models. Outwardly it looks a lot like the NEX-7, at least at first glance. The front of the camera is dominated by the relatively large, rubberised hand-grip, which enables users to hold the camera comfortably, and also conceals the shared battery / memory card compartment. The Sony NEX-6 undoubtedly feels solid when gripped in the palm, without looking or feeling bulky. Our review unit came with the brand new Sony E PZ 16-50mm f/3.5-5.6 OSS power zoom, which is currently the smallest E-mount zoom lens by a rather wide margin – certainly smaller than the old 18-55mm kit zoom that invariably looked oversized no matter which NEX body you attached it to. When not in use, this lens retracts into its housing, much like a compact camera lens – or indeed the Panasonic Lumix G X Vario PZ 14-42mm f/3.5-5.6 Power OIS standard zoom for Micro Four Thirds. This lens contributes a lot to the low profile of the Sony NEX-6, making the combination compact enough to fit in a large coat pocket – something that would be a stretch with the older kit lens. The downside of using a collapsible power zoom like this is that it causes start-up (and wake-up) times to be longer than usual. Those who aren't keen on the idea of shooting with a power zoom can of course buy the camera in a body-only configuration and purchase any lens from the slowly but steadily growing range of E-mount optics to go with it. On the forward-sloping edge at the top of the hand-grip we find the shutter release encircled by a nicely rigid on/off switch. In use, we have found that the NEX-6's shutter release was less sensitive to a half-press than that of most other cameras – essentially it required more like a “three-quarters-press” to do anything. Some photographers will like this, whereas to others the relative insensitivity of this button may give the false impression that the camera is less responsive than it actually is. As to the shutter itself, it's louder and clunkier in action than most other compact system cameras; somewhat reminiscent of the mirror return of an SLR, though still quieter than, say, a Nikon D7000. To most users this won't be an issue but if you need to work absolutely discreetly and quietly, you might want to take a look at some of the NEX-6's mirrorless competitors. Next to this accessory shoe is the NEX-6's built-in flash, which has essentially been lifted from the NEX-7 (though Sony quotes a somewhat wider angle of coverage for the new model). To pop up this flash you need to press a dedicated button at the top of the rear plate – in use we have found this button to be a little fiddly, requiring a rather strong press to do its job. A clever hinged design allows the flash to be raised high above the lens to avoid red-eye issues, something we have found to work very well. The flash settings can be modified from within the Camera menu, while the AE Lock button can be reprogrammed to provide easy access to flash exposure compensation. This is seldom needed though – as long as your subject is within range, the flash provides consistently good exposures, no doubt thanks to Sony's access to Minolta technologies such as ADI (Advanced Distance Integration). Our only gripes with this flash are the low guide number (GN 6 in metres at ISO 100/21°) and the fact that it cannot act as a commander for wirelessly slaved system flashes – even though the camera itself has the capability, you still need a compatible hotshoe-mounted external unit to use that feature. On the right-hand side of the top plate – still viewed from the rear – we find one of the biggest novelties of the NEX-6 compared to other Sony NEX cameras – a mode dial. Aside from standard shooting modes like Programmed Auto, Aperture Priority, Shutter Priority and Manual, this dial has separate markings for Intelligent Auto, Superior Auto, Scene Modes and even Sweep Panoramas. The chief difference between Intelligent Auto and Superior Auto is that in the latter mode the camera might decide to shoot a quick series of images for automatic HDR exposure blending if it determines that the luminosity range of the scene is wider than the dynamic range of the sensor. The mode dial itself is very stiff, so your chances of inadvertently switching to another shooting modes are extremely low. On the flip side, this stiffness means that you may need a thumb and a finger to change modes – if you try too hard to turn the dial with your right thumb only, you might end up spinning the control wheel underneath the mode dial too, thereby unwillingly changing the aperture, for example. Putting aside the omission of the AF/MF toggle, the rear plate of the Sony NEX-6 looks remarkably similar to that of the NEX-7, the majority of it taken up by the large articulated LCD that stretches from the base to the top plate. The Sony NEX-6 offers switchable framing lines, a live histogram and a dual-axis level gauge display in both the LCD screen and the viewfinder, helping you to compose your image and keep horizons straight. The NEX-6 also has a clever eye level sensor that switches off the rear screen's info display as you bring your eye close to the excellent viewfinder, although be aware that this might cause a slight inconvenience when shooting from the hip if your body blocks the eye proximity sensor. One of the most useful ways to set up the EVF and LCD is to compose your shots with the former and use the latter as an interactive status screen. In this view, you can check all of the camera's important shooting settings at a glance, and even modify them by first pressing the Function button and then moving about the screen using the navigation pad. This is important as the menu system of the Sony NEX-6 is rather illogical – e.g. the metering mode is found in the Brightness/Colour menu that from the look of the icon that denotes it initially appears to be for adjusting screen brightness only. By using the rear screen as an interactive status display you can mostly save yourself from having to delve into the menu. The LCD is hinged but only flips up and down – you cannot fold it out as on some competing models. Also missing is any sort of touchscreen functionality – while many of you will never miss this, we think it's a pity that you cannot set the active focus point by touch as on the NEX-5R for example. Also, given that the Sony NEX-6 offers built-in Wi-Fi it would have been nice to be able to enter passwords and other text via an onscreen virtual keyboard the same way you do on most smartphones. Above this display is one of the NEX-6's main advantages over its principal rivals, a high-resolution XGA OLED electronic viewfinder identical to the one found on the NEX-7. Offering 100% scene coverage, a bright, high contrast image and a high magnification, the NEX-6's EVF is so good that we used it for the majority of our shooting in both good light and bad, a real testament to its quality. For us the built-in EVF is one of the main attractions of the NEX-6 when judging it against the compact system camera competition. The placement of the finder in the upper left corner of the backplate is another plus point as it allows you to look into the EVF without smashing your nose against the rear screen – unless you're left-eyed, of course. Still on the topic of the EVF/LCD, the Sony NEX-6 has an excellent focus peaking feature available when you are using the camera in manual focus mode. This function enhances the outline of in-focus ranges with a specific colour (red, yellow or white depending on user preference) in the viewfinder or on the rear screen. The peaking level can be fine-tuned by the photographer via the Setup menu. Like the NEX-7, the Sony NEX-6 has three unmarked, context-sensitive “soft” buttons on its rear plate that change their functions depending on what mode, screen or menu you are in. The uppermost button usually takes you to the main menu, whereas the lowermost one allows you to modify the image quality setting (in most modes) or change the active focus point if Autofocus Area is set to Flexible Spot. The third unmarked button is encircled by a scroll wheel that you can use to set the shutter speed or navigate menus. In Playback mode, this button is used to quickly zoom to 1:1 pixel view to check for critical sharpness. The top, right, bottom and left parts of this wheel can also be used as navigation buttons, much like a classic four-way pad. In Record mode, four different functions are mapped unto this navigation pad including Display, ISO, Exposure Compensation and Self-timer / Drive Mode. New to the Sony NEX-6 – versus the NEX-7 – is its built-in Wi-Fi connectivity. This gives you a number of options. With the free Play Memories Mobile app, you can control the camera remotely from your smartphone via Wi-Fi, although in our experience the control options are quite limited for the time being. You can see the camera's live view feed on your phone's screen, set exposure compensation and take a picture remotely but that's it basically – and communication between camera and phone can be quite slow too. It's also possible to hook the camera up to an existing Wi-Fi network – though as noted earlier, the lack of touchscreen functionality means entering passwords isn't fun – and access Sony's Play Memories service if it's available in your country. This in turn allows you to download Play Memories camera apps to the NEX-6. Some of these camera apps are free and potentially useful, such as Direct Upload which enables you to send selected photos from your camera directly to Facebook via Wi-Fi. Not all apps are free though, which is all the more surprising given that the selection of available apps is rather limited at the moment. 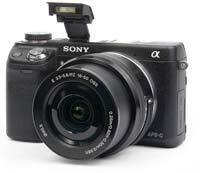 Apart from taking still photos, the Sony NEX-6 is also capable of shooting videos in either AVCHD or MP4 format. The HDTV-friendly AVCHD videos can be either interlaced or progressive, and offer a variety of frame rates. They can also be burnt to Blu-ray disks or DVDs using the supplied Play Memories Home software. By contrast, MP4 videos are easier to edit and share on a PC – if not with the Play Memories Home program – and are recorded as 1080p video files at a frame rate of approximately 30fps, with AAC sound. Speaking of sound, the Sony NEX-6 has built-in stereo microphones but lacks a standard microphone jack, meaning you cannot use a third-party external mic to record audio with your movie clips. Video recording can be initiated at any time by pressing the dedicated, camcorder-style video record button. This button has been relocated from its original position on the NEX-7, presumably because it was too easy to push accidentally. The new position of the button carries no such risks – in fact the button is now quite difficult to reach and certainly not comfortable to operate. By entering Playback mode via its dedicated button, you can review your photos and videos – though curiously, not both at the same time. You have to go into the menu to select whether you want to play back your photos, MP4 clips or AVCHD videos. This can be surprising at first and mildly annoying in the long run. Do note that if you have the 16-50mm power zoom attached to the camera, it will retract into its housing if you spend too much time in Playback. This also means that when you go back to Record mode you'll have to wait until it extends again, meaning you might miss a fleeting moment. Not only that, but when the lens does extend it will invariably default to the 16mm position, even if you'd had it set to a different focal length before it retracted. 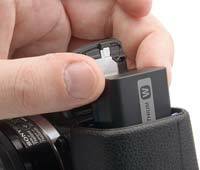 The camera is powered by a proprietary lithium-ion battery that can be charged in-camera via USB. A short mains cable is also provided along with a small adapter/transformer, but if you plan on buying a spare battery it's advisable to also invest in an external charger, otherwise you won't be able to use one battery in the camera while the other is charging.